"We are now finally crossing a threshold where, through very sophisticated modeling of large combined data sets from multiple independent observers, we can disentangle the noise due to stellar surface activity from the very tiny signals generated by the gravitational tugs from Earth-sized orbiting planets," said coauthor Steven Vogt, professor of astronomy and astrophysics at UC Santa Cruz. According to lead author Fabo Feng of the University of Hertfordshire, UK, the researchers are getting tantalizingly close to the 10-centimeter-per-second limit required for detecting Earth analogs. "Our detection of such weak wobbles is a milestone in the search for Earth analogs and the understanding of the Earth's habitability through comparison with these analogs," Feng said. "We have introduced new methods to remove the noise in the data in order to reveal the weak planetary signals." The same team also investigated tau Ceti four years ago in 2013, when coauthor Mikko Tuomi of the University of Hertfordshire led an effort in developing data analysis techniques and using the star as a benchmark case. "We came up with an ingenious way of telling the difference between signals caused by planets and those caused by star's activity. We realized that we could see how star's activity differed at different wavelengths and use that information to separate this activity from signals of planets," Tuomi said. The researchers painstakingly improved the sensitivity of their techniques and were able to rule out two of the signals the team had identified in 2013 as planets. "But no matter how we look at the star, there seem to be at least four rocky planets orbiting it," Tuomi said. "We are slowly learning to tell the difference between wobbles caused by planets and those caused by stellar active surface. This enabled us to essentially verify the existence of the two outer, potentially habitable planets in the system." A paper on the new findings was accepted for publication in the Astrophysical Journal and is available online. Amazing discovery! The illustration above, showing planets on the inner and outer edges of the habitable zone, may be hinting at the potential for terraforming to play an important role in our future. How old is the Tau Ceti system? Is it still in an early planetesimal phase? No sense building another Trump Tower and golf course with big, flaming rocks falling on you all the time. If the outer two giant-earths have a biologically compatible hydrosphere, that doesn't mean it's compatible with our biology. In addition to the extreme difficulty trying to adapt to the higher gravity. It remains to see if the inner two planets will turn out to usable much less habitable? And, again, if native biology is less than inimical to ours. rrwillsj, the unknowns vastly outnumber the knowns, maybe to the point of being ridiculous, so we will have to wait and see how this all plays out for a very long time to get all the answers (assuming it happens at all). For the time being (living in a pre-warp culture if you are a Star Trek fan), perhaps the biggest advantage this knowledge gives us comes down to improving our sense of perspective. It seems likely to me that we are going to discover far more terraformable worlds close by than those already having our preferred conditions. Once this becomes a hard scientific fact, as opposed to a mere educated guess, it will place the terraforming of Mars in a whole new light. For example, it might be a little easier to get serious about terraforming Mars when we realize living on any near-by planet within many light years will require terraforming too. Captain Stumpy, I agree with everything you wrote with the limited exception of terraforming only dead worlds. I agree that worlds with animals and more sophisticated life forms should probably be left alone. On the other hand, if a world supported bacteria only, we probably should be more concerned about dealing with it (as you suggested) than the morality of potentially destroying it. As a practical matter, my guess is bacteria exists in most habitable zone planets. Of course I suspect that is what you meant by "dead" worlds. I'm not seeing this on other sites where I would expect to see this publicized. Of course I suspect that is what you meant by "dead" worlds. All the planets are out of the zone that supports life. 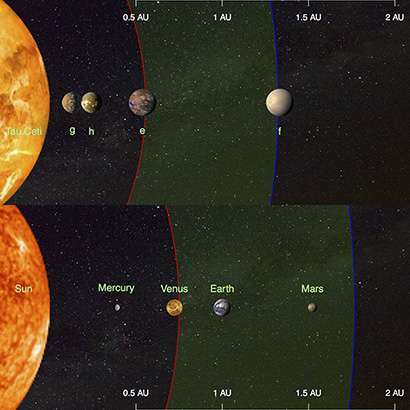 4 planets are too close to the star, with their large mass (although the star of 0.78 mass Sun) are very hot body. The mass, f of the possible planet, is over 6.6 M⊕ for distance 1.35 giving a hot body. Life would be possible to have a mass of about 3 M⊕ (and less) at this distance with a star mass of 0.78 MSun. Modeling the planets as blackbodies is a good start, but neglects potential atmospheric effects. For instance if Tau Ceti-e has a large albedo and lacks most greenhouse gases, it could be habitable. If Tau Ceti-f has a low albedo and a ton of greenhouse gases that too could be habitable. It's a reasonable assumption that larger mass planets will retain more massive atmospheres, so if F has some CO2, CH4 or H2O, it might be a great place to vacation. E seems to just be too close and too massive. I'm not challenging your opinion, merely hoping you could elaborate a little. Why would terraforming planets on the edge of the habitable zones be beneficial? With that much debris in the system and the probability of many moons, any civilization capable of reaching Tau Ceti from Earth will establish rotating habitats on asteroids and convenient moons before looking at the investment needed to terraform a super earth planet for the few who are not comfortable living in space. Conditions in said habitats will be closer to Earth like or whatever else is desired than the conditions on a planetary surface. They might do it eventually, but first will come a space civilization. Over the years, I have had many discussions with females if the opposite persuasion about this very issue of colonizing off-Earth. I cannot remember, one single adult woman willing to volunteer to colonize. Several of the women suggested variations of: First, men have to let themselves be reproductively altered. That the manly pioneers can be impregnated and carry a fetus to term. Then, the shell-shocked survivors (if any) asked if they would volunteer to do it again? I think this is a variation of: If Men were forced to have babies? Abortion would become a Holy Sacrament! Nero_Caesar, at the risk of oversimplifying to put this into a more conventional context, think of these worlds as "fixer-upper" or "handyman special" real estate properties. Not particularly pleasant or even practical to live in now, but with the potential to be nice with a lot of hard work (sweat equity). I agree with Captain Stumpy that terraforming planets outside the solar system is a very long way off, but again, we are talking about developing a more mature perspective of our place in the cosmos. In the more immediate future, I am convinced we are capable of reaching Mars, and I am far from alone. NASA has said that with proper funding they can and will do it. SpaceX is committed to it. Once we reach Mars the next step is colonization and those efforts will be greatly enhanced by terraforming. It is my strongly-held opinion that terraforming is, or at least should be, in our future.